Click View > Attributes to show and focus the Attributes view. The Attributes view displays all possible attributes of the current element. It is the fastest way to add attributes and their values in XMLBlueprint. • Mandatory attributes are displayed in bold. • Attributes that are present in the text are displayed in green. • Attributes that are not present in the text are displayed in italic and light grey, enumerations are also shown. 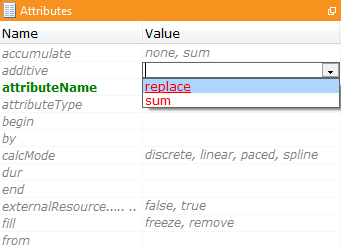 Clicking in the Value column will start the editing of the attribute value. Enumerations are now displayed in a combo box.